It’s lunch time! 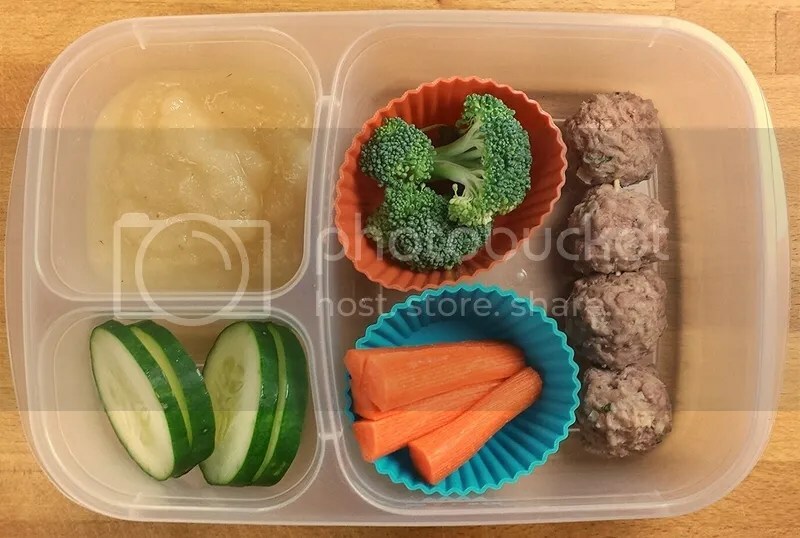 Here’s another look at what Kiddo1 brought to school for lunch last week. If you’ve been keeping up with our “three big posts” for March, you know we have one more big one on the way! I’ll give you a hint… it does have something to do with lunches, in a small way. 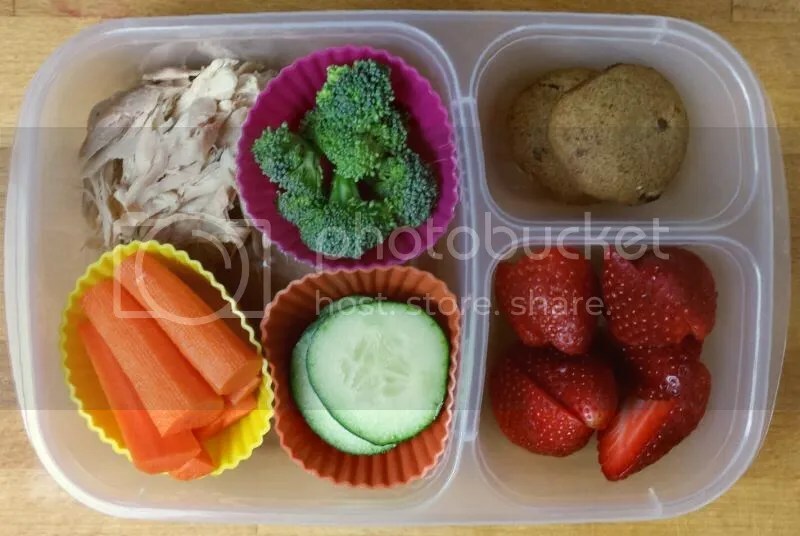 And we got a new lunch container – no more plastic boxes! So coming soon you’ll see a slightly different weekly wrap up. Next week is Spring Break so stay tuned for the launch date for Wrap Up 2.0 in two weeks! Leftover pork roast for lunch on Monday! 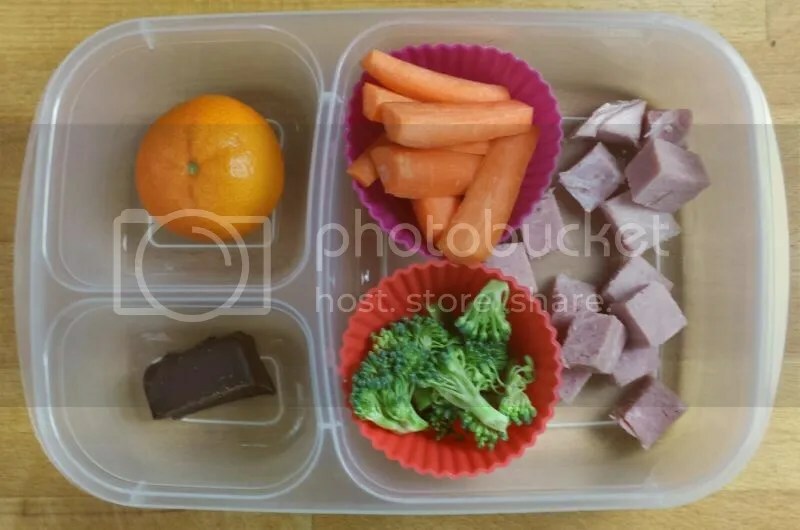 And we have been continuing with our rainbow carrots – today Kiddo1 had yellow carrots with some broccoli. For sweets he had strawberries and applesauce. Lately I’ve been obsessed with making myself sandwiches (darn pregnancy hormones!) so there has been more lunch meat in the house lately. 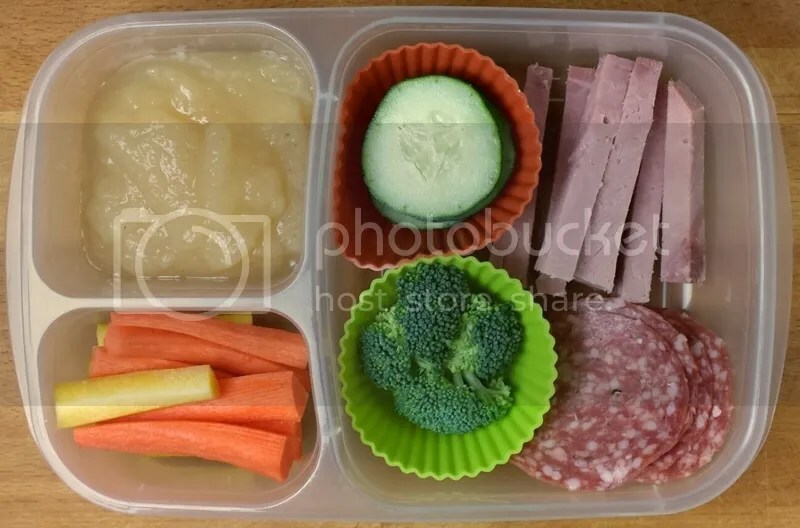 For Tuesday’s lunch Kiddo1 got one of his favorites: rolls of ham lunch meat (and turkey this time too) with slices of cucumber in the middle. 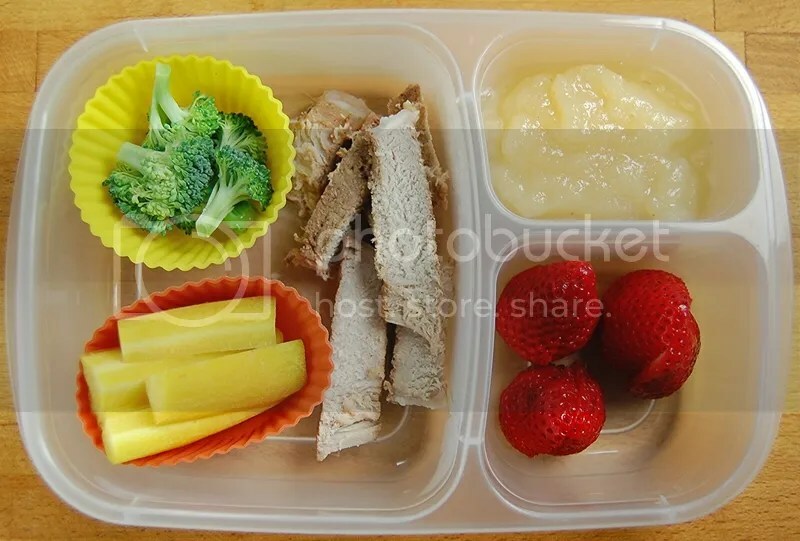 He also had more broccoli, a mix of yellow and orange carrots, and more applesauce. I’m not sure why this picture looks so weird… maybe I left an extra light on or something? 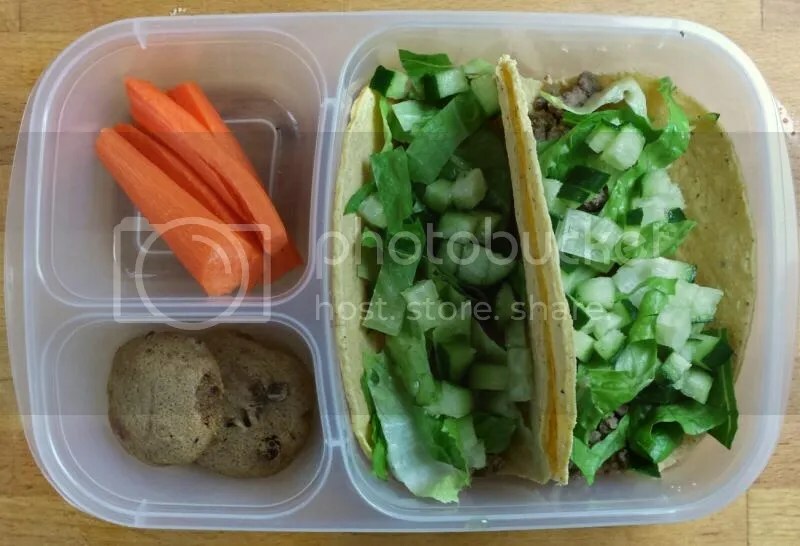 Well anyway, Wednesday is always leftover tacos day, I believe we had beef tacos this week (it seems to be alternating between ground beef and ground pork lately – tonight we’re having chicken tacos though! ), always served with shredded romaine and diced cucumber on soft corn tortillas. He had yellow and purple carrots with strawberries. Recently Kiddo1 told us he likes salami (where did that come from??) and since I’ve had some around lately for my sandwiches (and it is casein free! 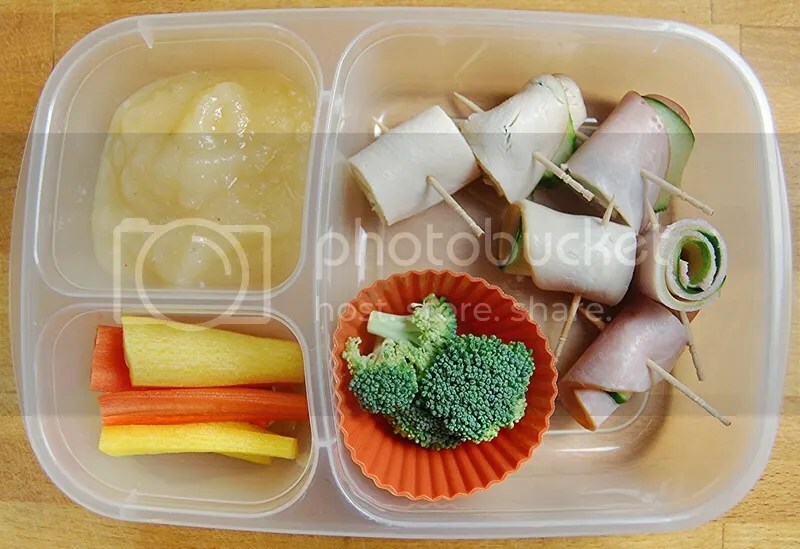 ), Kiddo1 got some along with ham sticks in his lunch. He also had the veggie trifecta: cucumbers, broccoli, and carrots. And rounding out the goodness is more applesauce. Finishing out the last day before Spring Break, and the last day of the trimester! And I had no idea what to make for lunch! 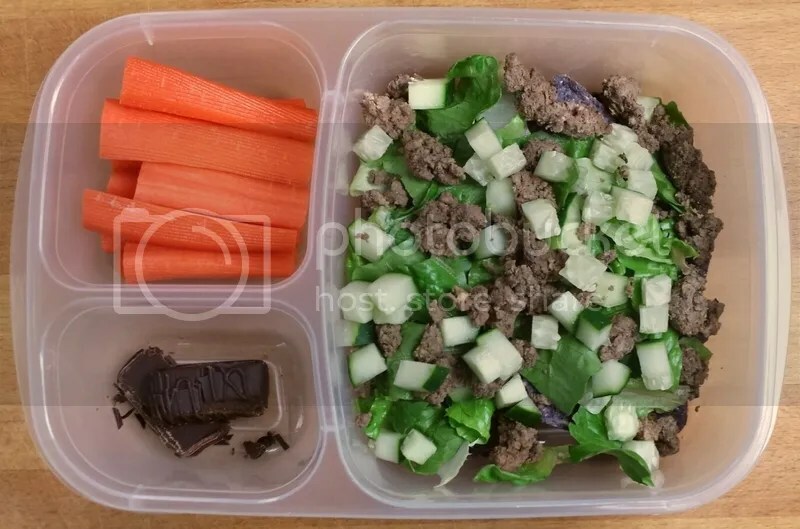 So I settled on the rest of the leftover taco meat in a “taco salad” with blue corn tortilla chips (it’s hard to see them under there) plus Kiddo1’s traditional taco toppings of shredded romaine and diced cucumber. He also had even more carrots and a couple small slices of vegan dark chocolate truffle from Missionary Chocolates. See you for new and improved lunch posts in two weeks! Posted in Diet, Kids, School Lunch, School-age Kid and tagged clean eating, dairy allergy, dairy sensitivity, dairy-free, diet changes, egg allergy, egg sensitivity, egg-free, food allergies, food sensitivities, gluten free, kids diet, kids lunch, lunch, lunch packing, meal planning, nut allergy, nut sensitivity, nutrition, peanut allergy, peanut-free, school lunch, wheat allergy, wheat sensitivity, wheat-free. Bookmark the permalink. We started off simple and basic on Monday. 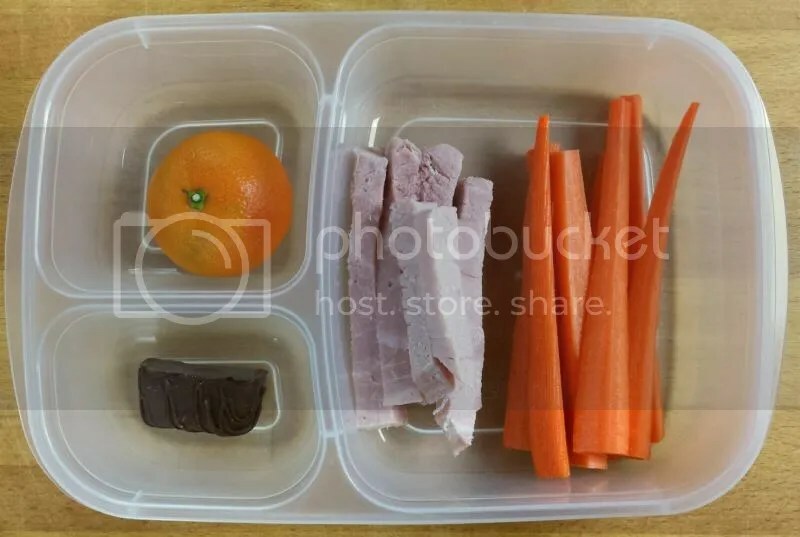 No meat leftovers from Sunday so Kiddo1 got some “sticks” of ham, along with carrots, cucumbers, a Mandarin orange, and strawberries (organic strawberries were on sale again – score!). More ham on Tuesday – apparently we needed to cook more last week! But things around here have been super busy so I guess ham comes to the rescue again! More cucumbers on Tuesday, along with carrots – but this time they’re special yellow carrots! Another Mandarin orange and two Enjoy Life chocolate chip cookies. Leftover tacos on Wednesdays! 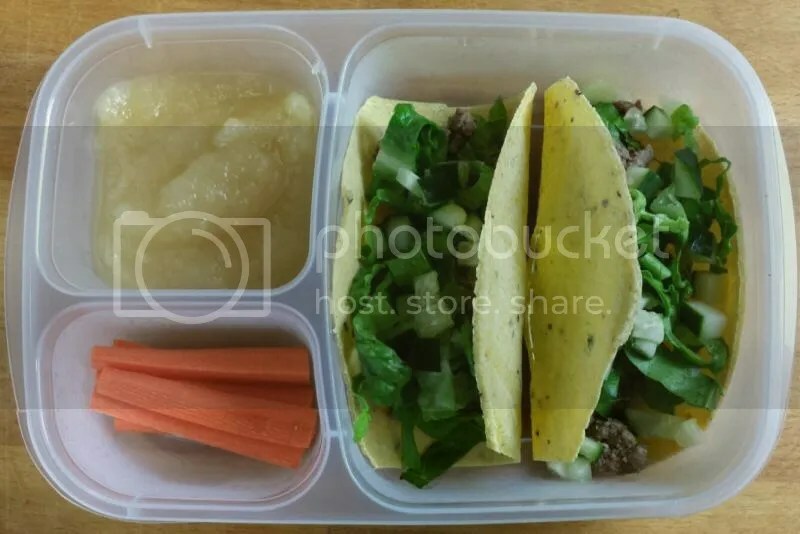 This week we had ground pork with our tacos, and Kiddo1 likes his with romaine and cucumber on a soft organic corn shell. He also got purple carrots (we’re on a colorful carrot kick! ), broccoli, apple slices, and a couple more Enjoy Life chocolate chip cookies. 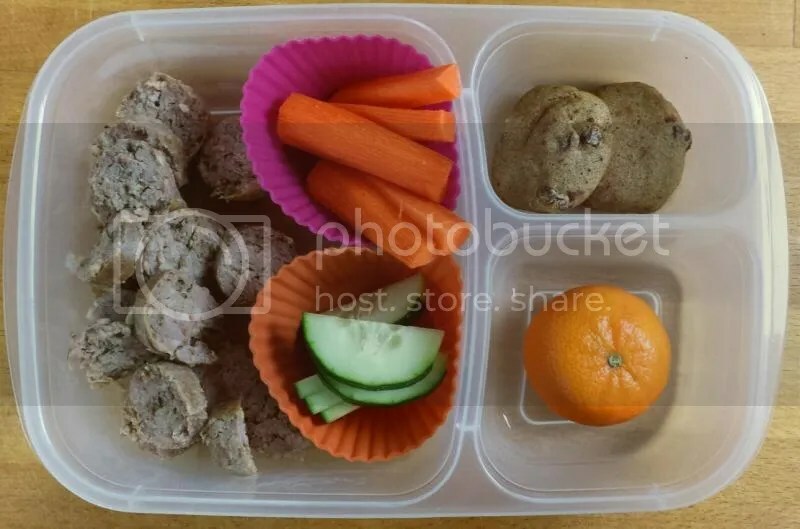 For Thursday’s lunch Kiddo1 got leftover meatballs we made Wednesday night from more of the ground pork we got in our half pig share. 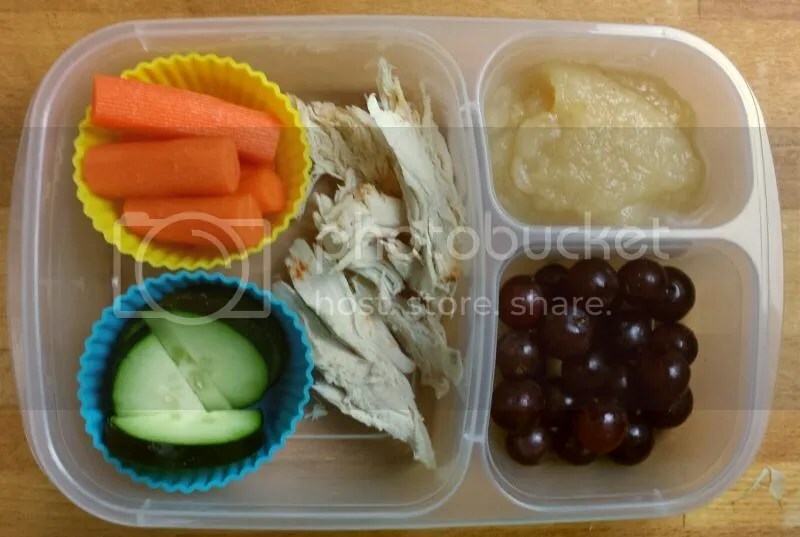 He also had broccoli, carrots, cucumber, and some apple sauce. On Friday there was no school, yay! And only one more week of lunches before Spring Break! See you next week! Posted in Diet, Kids, School Lunch, School-age Kid and tagged clean eating, dairy allergy, dairy sensitivity, dairy-free, diet changes, egg allergy, egg sensitivity, egg-free, Enjoy Life, food allergies, food sensitivities, gluten free, kids diet, kids lunch, lunch, lunch packing, meal planning, nut allergy, nut sensitivity, nutrition, peanut allergy, peanut-free, school lunch, wheat allergy, wheat sensitivity, wheat-free. Bookmark the permalink. We’re back to regularly scheduled weekly lunch posts! We started off the week with some strips of leftover chicken. We usually eat a whole chicken every other week or so, and when we’ve had our fill we strip off all the leftover meat and make a broth with the bones. I love that our chickens do double-duty, or even triple-duty, for us – we get dinner, some lunch leftovers, and tasty broth too! 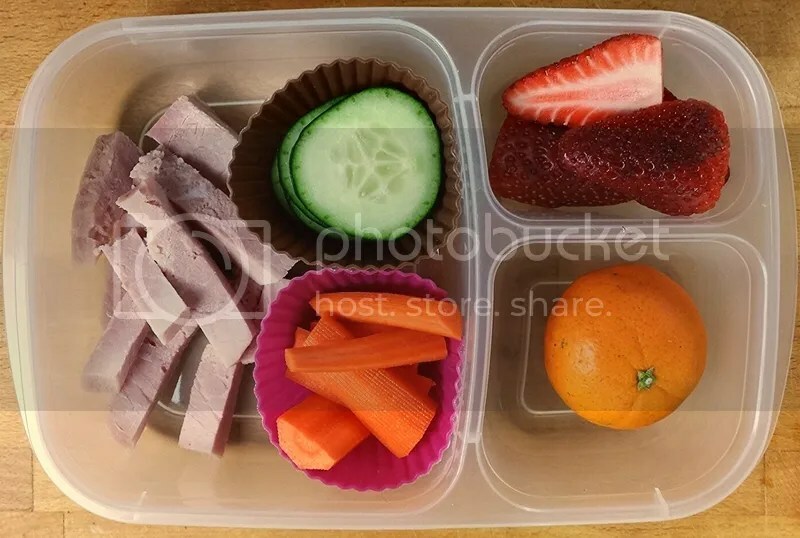 But back to this lunch… Kiddo1 also had his fairly standard carrots and cucumber, along with some strawberries (organic strawberries were on sale last week – it’s almost strawberry season!). 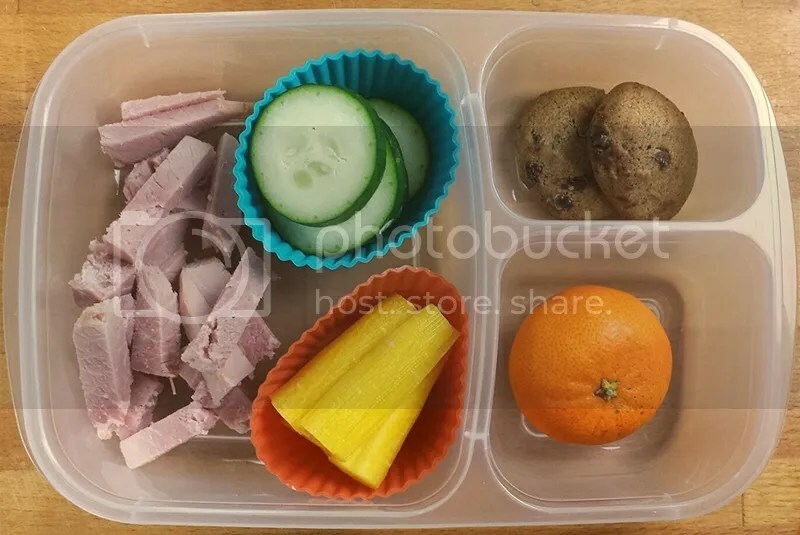 No leftovers from Meatless Monday so Kiddo1 had ham, more carrots and cucumbers, a Mandarin orange, and Enjoy Life chocolate chip cookies. 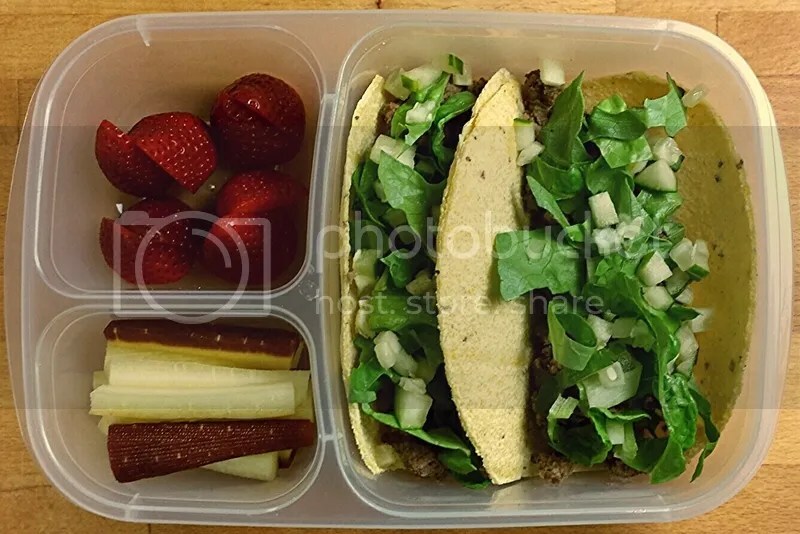 Beef tacos again this week, since they’re Kiddo1’s favorite. Plus more carrots and cookies! A fairly standard Wednesday lunch. 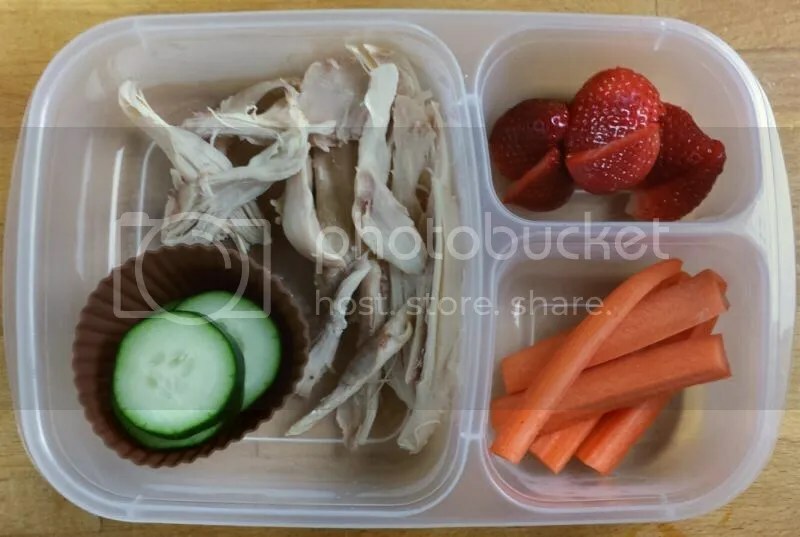 Kiddo1 finished off the leftover chicken for Thursday’s lunch, plus had a bunch of veggies and fruits – carrots, broccoli, cucumber, and strawberries. And of course the Enjoy Life chocolate chip cookies are not to be forgotten! 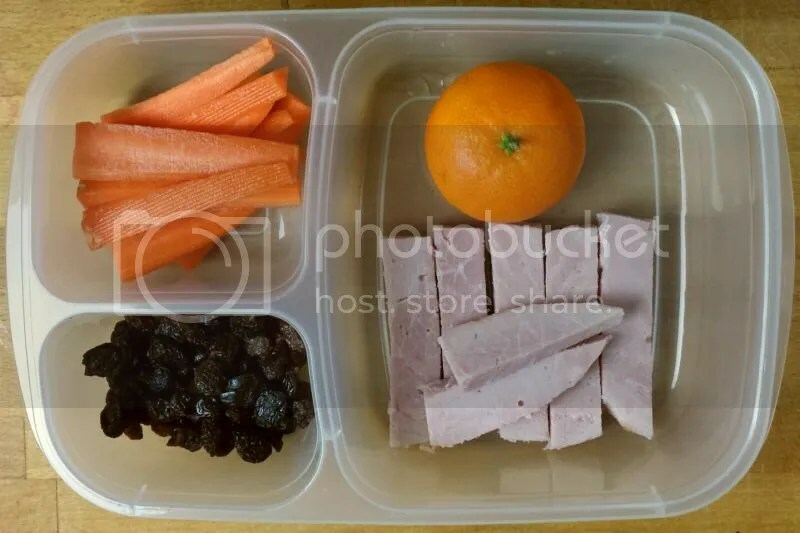 Finishing off the week by finishing off a few things from the fridge – the last of the carrots, some more ham, another Mandarin orange, and a special request for raisins. And those are the lunches for this week! So after much teasing last week about the “three special announcements” for March, I’ll finally have the first one published this weekend. And it won’t involve lunch foods at all! Whew, the last catch up post is here! This one covers the last week of February. Next lunch post will be at its regularly scheduled day on Tuesday. And of course, since I haven’t mentioned it already (ha!) there are three big posts/announcements coming in March too! Keep checking the blog or drop your email in the “Follow” box at the right to stay updated. Kiddo1 hasn’t had a lettuce wrap in a long time! We had some leftover pork roast from Sunday night so I figured wrapping it up would be the best way to get him to eat it. There’s also diced cucumber in the wrap. On the right we have carrots sticks and a couple Enjoy Life chocolate chip cookies. 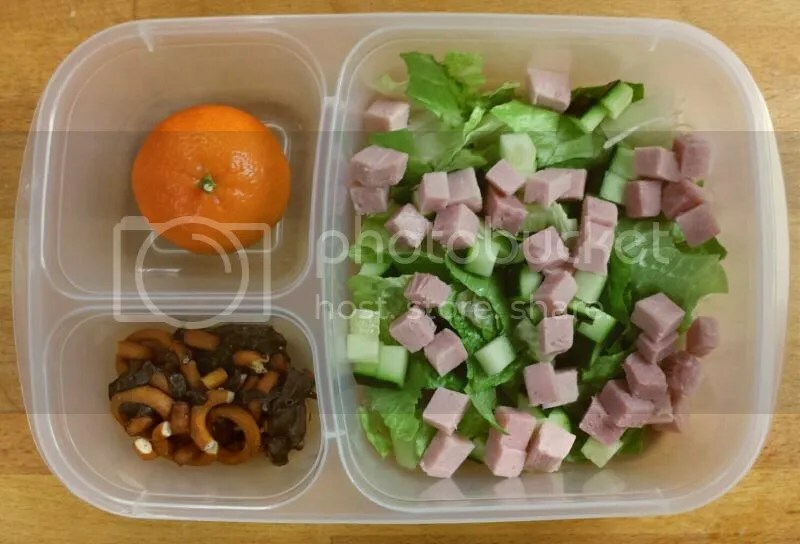 Once again we were out of meat leftovers for Tuesday’s lunch (because Monday nights are meatless) but we do almost always have our back-up: ham! We buy Beeler’s uncured ham. 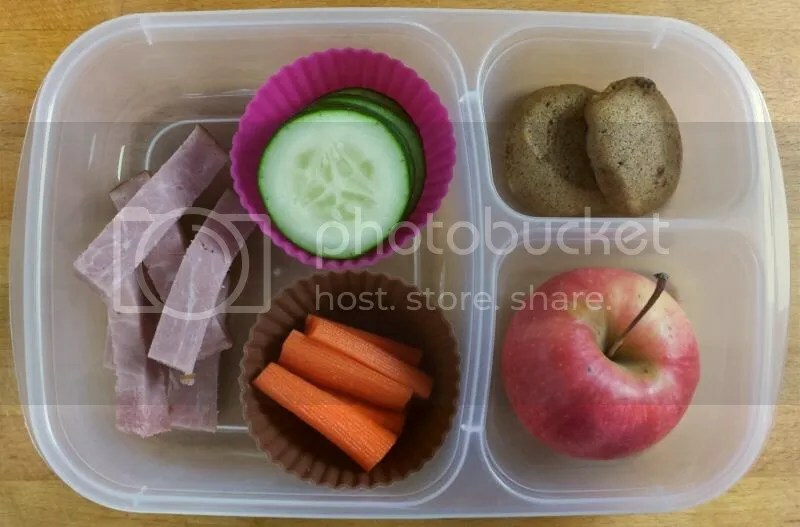 Kiddo1 also had his usual carrots and cucumbers, plus a nice-sized little Pink Lady apple and a couple Enjoy Life chocolate chip cookies. It was a chocolate chip cookie week around here! No leftovers again on Wednesday, this time it was because we went out to eat on Tuesday night – something we rarely do anymore! But it was my birthday and the family wanted to celebrate, so we did a bunch of research to find a place where Kiddo1 could eat foods that he would both enjoy and wouldn’t give him tummy troubles. We found a place willing to make some plain chicken and french fries for him – it was so good we didn’t have any to take home for lunch the next day! So instead of more ham I cut up these meatsticks that everyone in the family loves. The are beef and organ – yes organ – meat, super good for you and you don’t even know it is in there! Kiddo1 was a little weirded out at first but he loves them – and loves freaking out his friends a little when they see the package. Kiddo1 also had a bunch of good-looking veggies and some more Enjoy Life chocolate chip cookies. On Wednesday we had to have tacos (since we missed them on Tuesday night) – a week can’t go by without tacos! 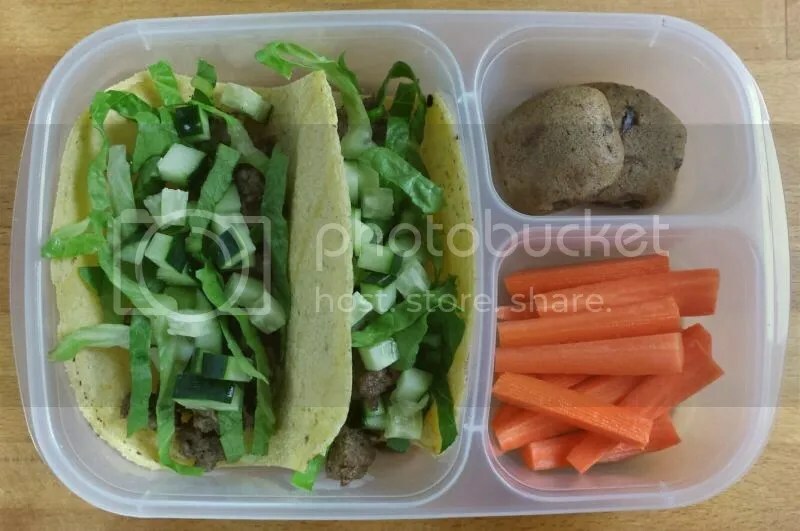 For Kiddo1 we had beef tacos again (two weeks in a row! ), along with his favorite toppings, romaine and cucumber. He also had more carrots and cookies. On Friday, Kiddo1 had more sausage from the pork buy we got in February. Our whole freezer is full of nothing but pork right now, so we’ll be eating a lot of it! 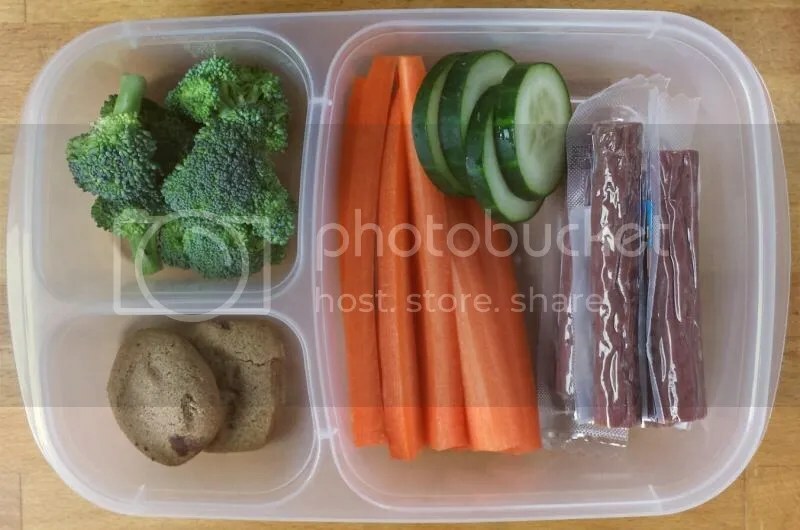 Completing this lunch are more carrots, cucumbers, another mandarin orange, and the rest of the Enjoy Life chocolate chip cookies. See you with more lunches on Tuesday! Have a great weekend! Posted in Diet, Kids, School Lunch, School-age Kid and tagged clean eating, dairy allergy, dairy sensitivity, dairy-free, diet changes, egg allergy, egg sensitivity, egg-free, Enjoy Life, food allergies, food sensitivities, gluten free, kids diet, kids lunch, lunch, lunch packing, meal planning, Missionary Chocolates, nut allergy, nut sensitivity, nutrition, peanut allergy, peanut-free, school lunch, wheat allergy, wheat sensitivity, wheat-free. Bookmark the permalink. Here’s our second of three “catch up” lunch posts to get us back on track after a busy no-post February! There are also THREE big posts/announcements scheduled for March coming up too – and they aren’t involving lunch! But for now, let’s get to the wrap up – this post covers the third week of February (no posts for the second week because I was out of town). Monday – no school, happy President’s Day! Kiddo1 had some leftover bits of pork chop on Tuesday with a side of bbq sauce. It’s been difficult finding good bbq sauce – one without corn syrup (or even without a ton of sugar), no artifical flavors/colors, etc. This one is the Woodstock brand and it is pretty tasty, plus organic and a decent ingredients list. Kiddo1 eats it with everything! He also had his usual carrots and cucumber, plus two Enjoy Life chocolate chip cookies. More leftover tacos! 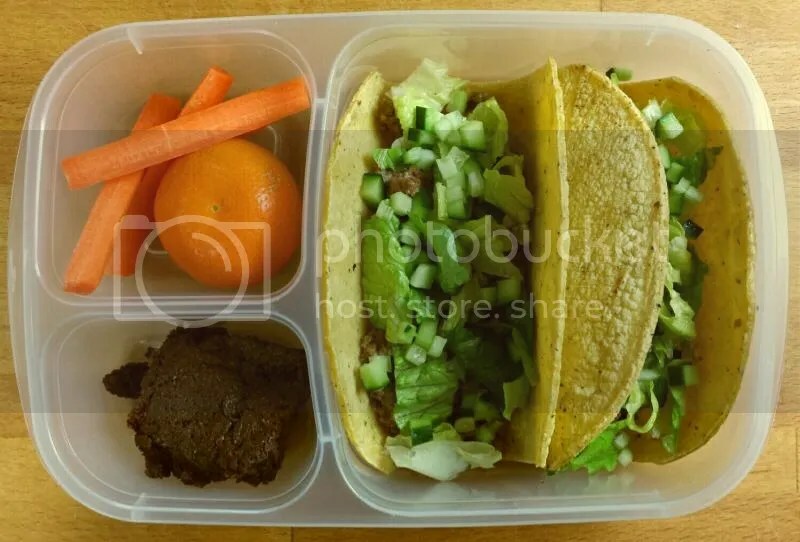 This week we had beef tacos, Kiddo1’s favorite. He also had his favorite applesauce and some carrots. And this week we had a good supply of cucumbers so no running out before Wednesday like last week. Iin February we bought a half pig’s worth of pork and it came with a whole lot of the boys’ favorite – sausage! So you’ll see a few lunches with sausage over the next couple posts. Normally I’m not a huge fan of processed meats – we try to limit ham (but everyone loves it so we’re not too successful), but this sausage isn’t too bad because it is pretty “minimally processed,” if that’s a thing. We talked a lot to the butcher who processed our pork and he left the sausage uncured and kept the ingredients minimal and to our “clean eating” standards. So I can’t complain too much about this sausage! “Rounding out” this lunch – haha, notice all the round foods? 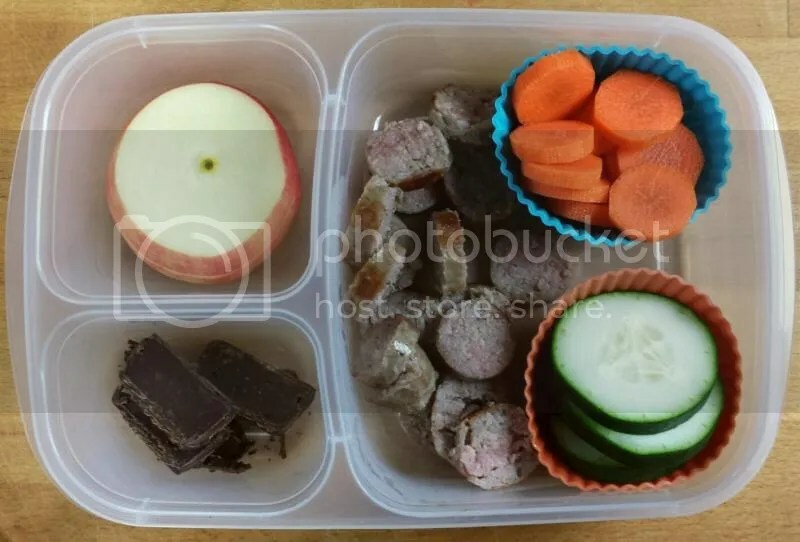 – are carrot rounds, cucumber, slices of apple (they don’t brown too much if you keep them stacked up like this) and some slices of vegan dark chocolate truffle from Missionary Chocolates. 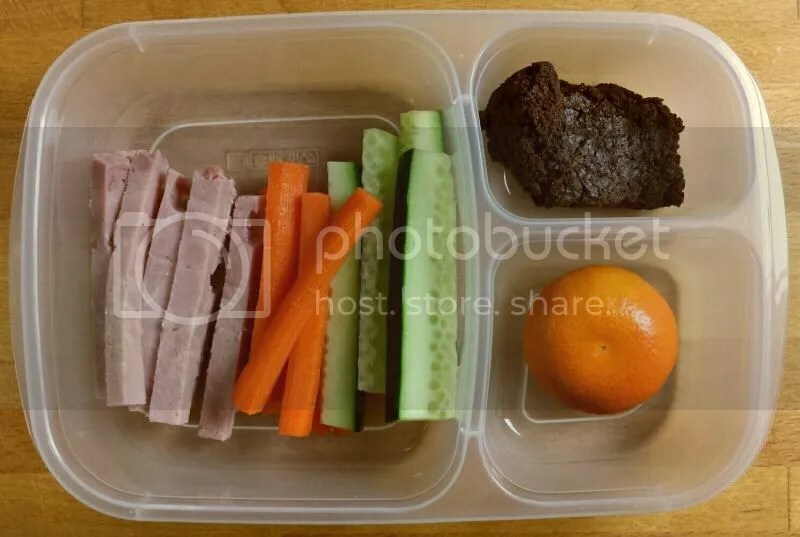 On Friday, Kiddo1 said he wasn’t too hungry so we packed a fairly minimal lunch of ham sticks (we can’t ever get away from ham! ), carrot sticks, a mandarin orange, and more vegan dark chocolate truffle from Missionary Chocolates. Posted in Diet, Kids, School Lunch, School-age Kid and tagged clean eating, dairy allergy, dairy sensitivity, dairy-free, diet changes, egg allergy, egg sensitivity, egg-free, food allergies, food sensitivities, gluten free, kids diet, kids lunch, lunch, lunch packing, meal planning, Missionary Chocolates, nut allergy, nut sensitivity, nutrition, peanut allergy, peanut-free, school lunch, wheat allergy, wheat sensitivity, wheat-free. Bookmark the permalink. 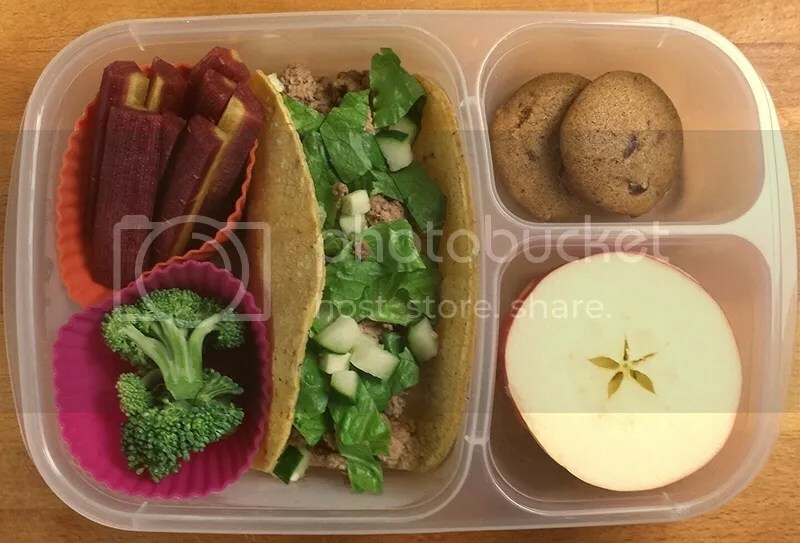 Yikes, we are waaaay behind on the lunch posts! February was just a crazy month around here. It started when I went away for a business trip and missed a Tuesday warp up post, then everything else in life got behind schedule too. I’m finally just now catching up so this week I’m going to marathon post all the lunches from February… except for those that I didn’t photograph while I was away. Another reason lunch posts have been delayed is that I’m working on THREE big posts/announcements that I plan to share in March. So watch out for those as they’re posted this month. 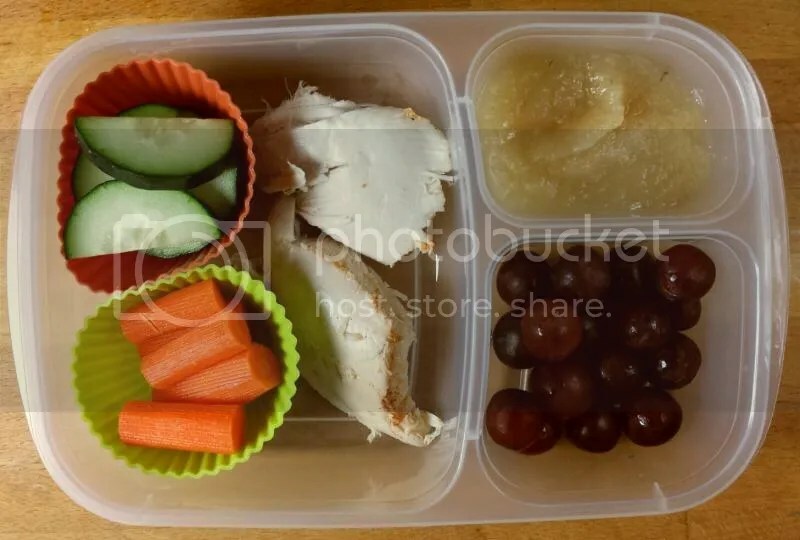 For now, on to the lunches of the first week of February! 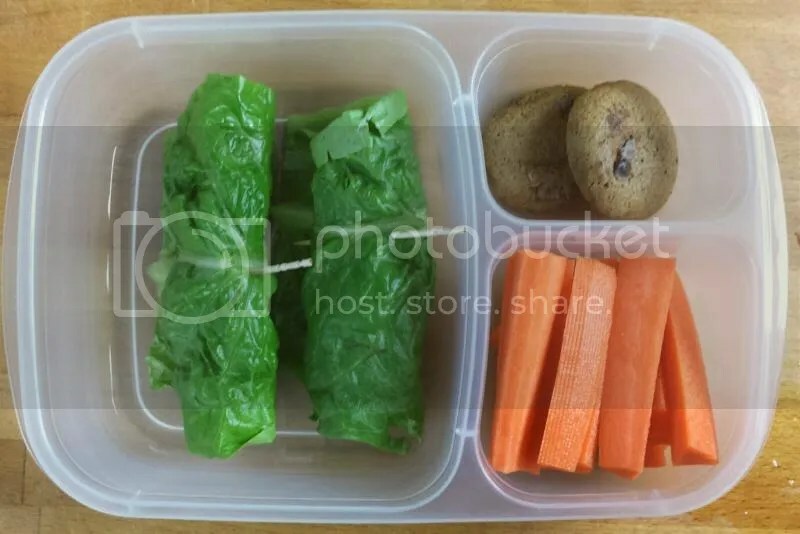 The first school day of February kicked off with our normal carrots and cucumber, plus some leftover chicken from Sunday night. For sweets, Kiddo1 had grapes and his favorite, applesauce. We changed up our veggies a bit on Tuesday, with broccoli instead of cucumber. Broccoli is still not Kiddo1’s favorite, but he will eat it if it’s given in small quantities. For protein he had ham, our go-to when there’s no leftover meat (because typically Monday nights are meatless). And rounding out the left side is a small mandarin orange and a chunk of vegan dark chocolate truffle from Missionary Chocolates. Wednesday is leftover taco day! 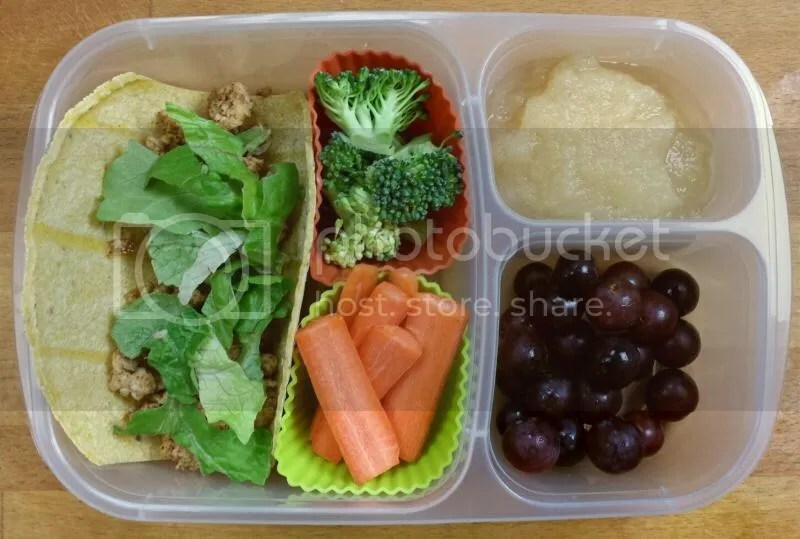 This week we had turkey tacos on Tuesday night, so Kiddo1 gets a leftover one with a bit of lettuce. He usually takes cucumber on his tacos as well, but we ran out! Hence the servings of broccoli two days in a row. But we tried to compensate with more grapes and applesauce. Friday was Kiddo1’s 12th birthday! 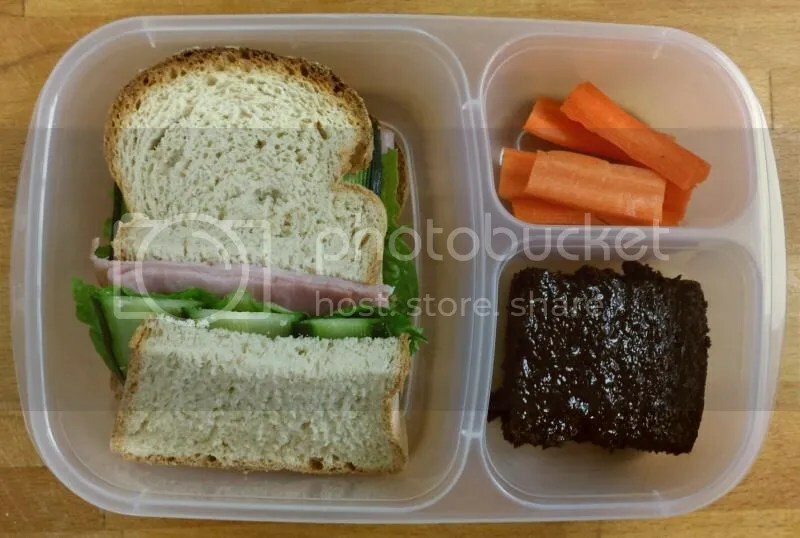 So he got something very special for lunch – a sandwich! He hasn’t had a sandwich for the whole school year. I usually make bread but it is more for toast, it’s not a real soft sandwich bread. And I haven’t made any bread since the New Year, mostly due to lack of motivation. But we found this amazing bread at the store from a company called New Cascadia. Their bread is pretty much just millet flour and yeast so we can eat it! And it is soft and wonderful. So Kiddo1 got a surprise birthday sandwich with ham, romaine, and cucumber slices. I think it looked pretty good! He also had some carrot sticks and a homemade birthday brownie. Tomorrow we’ll catch up on the third week of February (skipping the second week because that’s when I was away). More to come! Posted in Diet, Kids, School Lunch, School-age Kid and tagged clean eating, dairy allergy, dairy sensitivity, dairy-free, diet changes, egg allergy, egg sensitivity, egg-free, gluten free, kids diet, kids lunch, lunch, lunch packing, meal planning, Missionary Chocolates, nut allergy, nut sensitivity, nutrition, peanut allergy, peanut-free, school lunch, wheat allergy, wheat sensitivity, wheat-free. Bookmark the permalink. Monday – no school on Monday! A nice way to ease back in to the routine after vacation. Lots of sticks for Tuesday’s lunch! 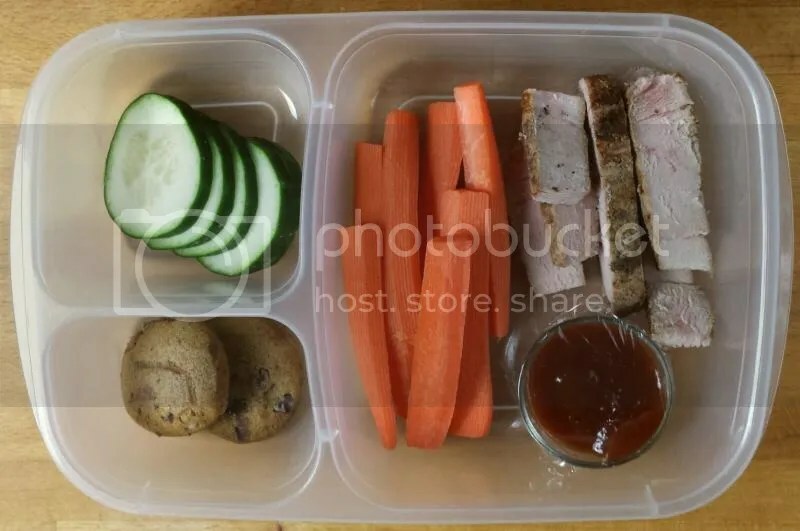 Ham, carrots, and cucumbers. The children have been obsessed with these little oranges, so Kiddo1 has been frequently getting them in his lunch. He also had some homemade brownies – yum! More carrots, brownies, and a little orange! Also leftover tacos, Kiddo1’s favorite. Still more little oranges to use up! 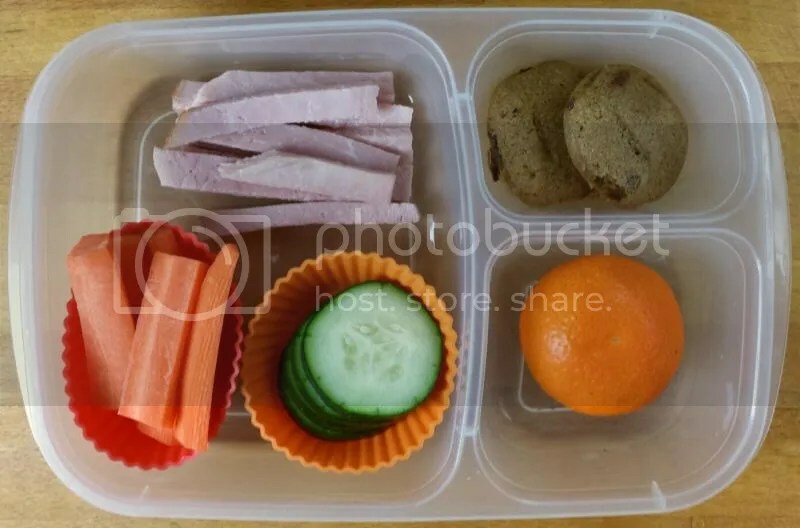 Kiddo1 also had a salad with ham, cucumber, and romaine lettuce. For dessert – vegan and gluten-free chocolate covered pretzels from Missionary Chocolates. Finally Friday – we made it through the week! 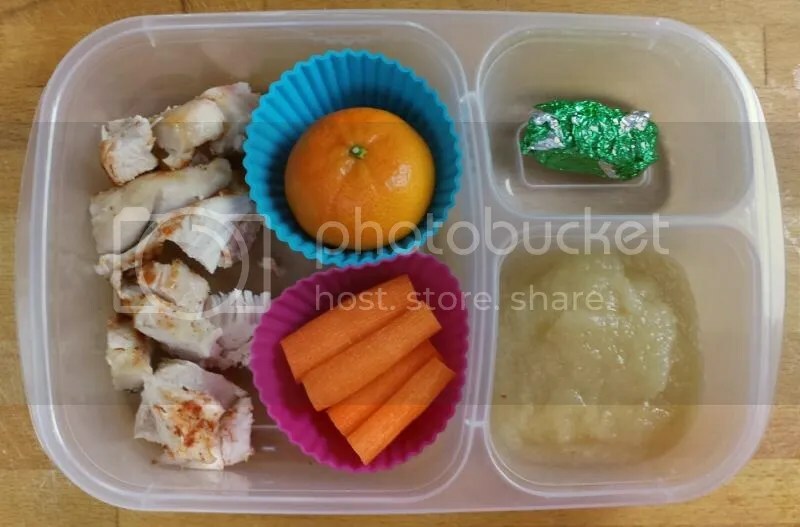 Kiddo1 had some chunks of leftover chicken, more carrots and cucumber, red graps, and applesauce for dessert. Posted in School Lunch, School-age Kid and tagged clean eating, dairy allergy, dairy sensitivity, dairy-free, diet changes, egg allergy, egg sensitivity, egg-free, gluten free, kids diet, kids lunch, lunch, lunch packing, meal planning, Missionary Chocolates, nut allergy, nut sensitivity, nutrition, peanut allergy, peanut-free, school lunch, wheat allergy, wheat sensitivity, wheat-free. Bookmark the permalink. Big March Post #3: A New Place for FOOD!